Bobbi Pritt, M.D., spends her work hours identifying and diagnosing infectious diseases. In her free time she celebrates their beauty by creating bug-related artwork and blogging about parasites. You can talk about the art and science of medicine. But few live it out quite like Bobbi Pritt, M.D. 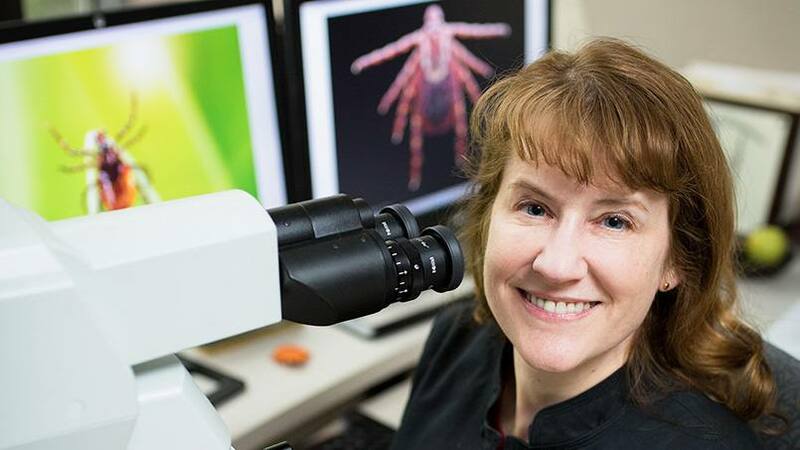 The art-major-turned-parasitologist is director of the Clinical Parasitology Laboratory at Mayo Clinic. She also has a pretty serious side hustle turning her work into art. Although this is a side hustle that's just about fun and education. "I am currently working on a parasite coloring book, and also have some 'arts and crafts' projects where I am embedding ticks in resin so that they can serve as long-lasting teaching displays," she writes on ID-Hub.com. That's in addition to the calendars, phone cases, miniskirts and other items she's created from enlarged images of creepy crawly things like tapeworms, lice nits and ticks. (Oh my!) Dr. Pritt gives the items as gifts and has made them available online. In May, she took first place in the annual Art in Pathology contest hosted by Mayo Clinic's Division of Anatomic Pathology. There were 41 entries, so clearly she's not alone in saying "Ahh!" where others might say "Eww!" Dr. Pritt is serious about her science, too, working with colleagues to diagnose infectious diseases based on test samples from around the world. "We can see a whole range of infectious diseases, including those that are not usually found in the U.S.," she writes on ID-Hub. "For example, my laboratory sees a large number of cases of malaria." 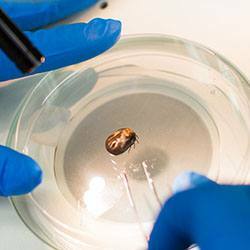 Her lab also identifies infections found closer to home, including Lyme disease and other tick-borne illnesses. In fact, Dr. Pritt's lab "has helped reveal two unknown bacteria that appear to cause tick-borne diseases," reports Minneapolis-St. Paul Magazine. One, a new form of Lyme disease, now bears the name Borrelia mayonii. "It's traditional to name new organisms either after someone great in the field … or you'd name it after the place where it was first discovered," she tells the Rochester Post-Bulletin. Dr. Pritt's enthusiasm for her work is contagious. (We couldn't resist.) She started a blog, Creepy, Dreadful, Wonderful Parasites, while studying parasitology at the London School of Hygiene and Tropical Medicine. As we reported back in 2015, the blog was designed to share interesting cases with her colleagues back home, but it soon drew interest "from nonscientists who were fascinated by the photos and descriptions of interesting bugs she was finding." Ten years later, that interest continues to the tune of around 25,000 page views a month — which is "pretty cool for a blog about parasites," Dr. Pritt notes. The blog includes a "Case of the Week," where she posts images of bugs or specimens under glass slides and invites readers to identify the bug or provide a diagnosis. She'll post her 500th case on July 2, and has fitting plans to mark the occasion. "To celebrate, I would like to recognize the creativity of my readers by displaying a photograph of your parasite-related artwork on my blog," Dr. Pritt writes. Three winners will receive "a special parasite prize." Feeling lucky? You can submit your entry to b_pritt@yahoo.com. Then bug us with your comments below before using the social media tools atop this page to share this story with others. Learn about Mayo Clinic's Clinical Microbiology Laboratory.